Congress chief Rahul Gandhi had said that demonetisation was a planned "brutal conspiracy" and a "shrewd scheme" to convert the black money of PM Modi's "suited-booted friends". Rahul Gandhi attacked PM Narendra Modi over demonetisation at a rally in Chhattisgarh. Sambit Patra accused Rahul Gandhi to be a "rich black money-holder"
Mr Patra also said the Congress supported "urban Naxals"
Roasted by Congress chief Rahul Gandhi's at an election rally in Chhattisgarh over demonetisation today, the BJP hit back with a biting retort of its own. 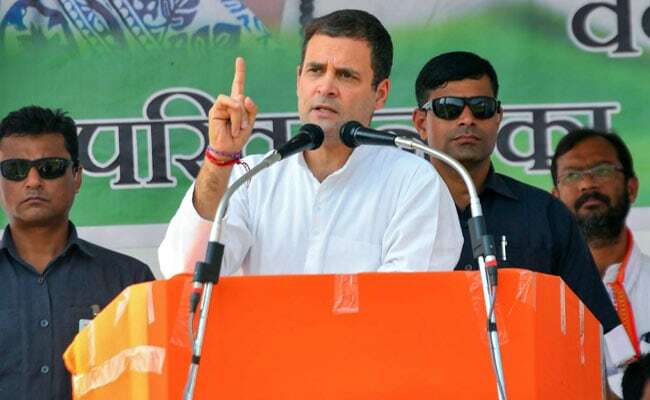 "Today Rahul ji in Chhattisgarh asked 'did anyone see any rich black money-holder get out of a big car and stand in the line during demonetisation'? I would like to tell him yes we saw you get out of your 4 crore car and stand in line," BJP spokesperson Sambit Patra said. Demonetisation, whose second anniversary was on Friday, destroyed the "ill-gotten wealth of the four generations of the Gandhi family", Mr Patra alleged, claiming that the move, which had made notes of Rs 500 and Rs 1000 invalid, led to many benefits, including increase in tax base, curbing black money and hitting Maoists. He also echoed Prime Minister Narendra Modi in saying that that Mr Gandhi's party supported "urban Naxals" - a term used by the BJP to refer loosely to those accused of helping Naxals - and described them as "revolutionaries". In his criticism, the Congress president had said that demonetisation was a planned "brutal conspiracy" and a "shrewd scheme" to convert the black money of PM Modi's "suited-booted friends". On Twitter, Mr Gandhi cited a news report claiming that two years after demonetisation unemployment has risen, saying, "2014 - Con trick 1: Make me prime minister, I will provide two crore jobs. 2016 - Con trick 2: Support me in noteban, I will bring back black money. 2018 - Reality: Will fly suit-boot friends in Rafale and shatter dreams of youths." The Congress has been accusing the government of hurting small businesses with its decision to demonetise large currency notes in November 2016 and also hurting the country's growth and economy.